Are you looking for visual impairment services that can be delivered in your home? Do you need assistance managing everyday activities that can be difficult to manage when living with permanent blindness? At Beacon Support, we understand living with visual impairment can present challenges and you may require help from an in-home service experienced in delivering support for visually impaired people. Through our many years of experience, we appreciate that living with visual impairment can be hard, sometimes requiring specialist support and equipment. Depending on the severity of your visual impairment, we can provide a range of care and support options. We can work with you to develop a customised visual impairment support plan, as well as manage symptoms that may be related to other conditions. We understand that each person can be affected differently by visual impairment, and the support we provide will depend on your specific circumstances. 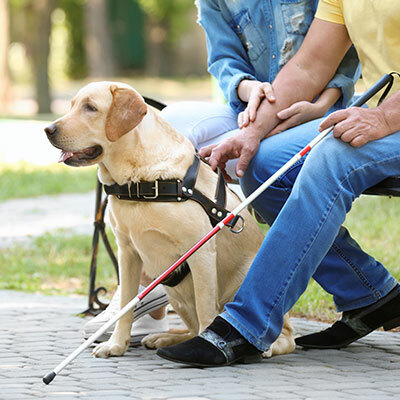 Our visual impairment services are primarily focused on helping you with everyday activities, as well as other symptoms or conditions you may be living with. Your visual impairment support plan will be designed based on a comprehensive understanding of your needs and maintaining client safety. We can also work in coordination with other services as required. Through the delivery of all of our visual impairment in-home services, we are committed to delivering care and support you can trust. At Beacon Support we are focused on making sure you feel supported at all times, via quality care and understanding. Every member of our team will approach your care professionally and with empathy at all times. Your support will also be delivered under the supervision of a Registered Nurse ensuring you receive the best of care. We are also a registered NDIS provider. Call us today at 1300 435 782 or contact us via our online form for a consultation or to learn more about our visual impairment services. We’re more than happy to discuss your specific visual impairment needs and advise how we may be able to support you.